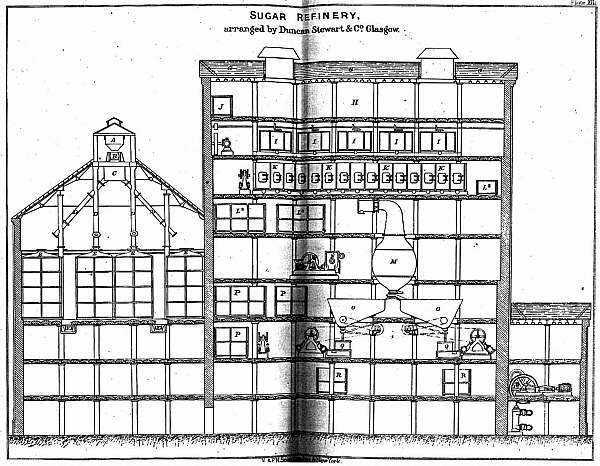 from "Essay on Sugar, and general treatise on sugar refining, as practised in the Clyde Refineries : Embracing the Latest Improvements"
Niccol wrote : "...they are pretty, lofty buildings with small windows, in most cases consisting of five or six low floors." The Uncommercial Traveller, created by Charles Dickens in the 1860s, visited the East End of London only a few times. On a walk to Wapping workhouse - "....was in Commercial Rd. Pleasantly wallowing in the abundant mud of that thoroughfare, and greatly enjoying the huge piles of building belonging to the sugar refiners,....". And once accompanying a policeman on his beat...."My beat lying round by Whitechapel Church, and the adjacent sugar-refineries, - great buildings, tier upon tier, that have the appearance of being nearly related to the dock-warehouses at Liverpool,..."
"The Uncommercial Traveller", a series of papers for a periodical, begun in 1860, by Charles Dickens, and edited and corrected by him in 1867-8. Frank Lewis writes : "...The statement...that all of the East End refinery buildings have disappeared needs qualification. 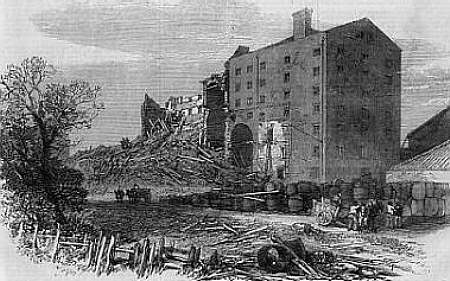 The 'London Advertiser' for 19 October 1972 describes the destructive fire at the Monastery Bonded Tea Warehouse in Dock Street, Whitechapel, and goes on to state that this nine-storey building, built in the early half of the 19th century, was formerly a sugar refinery, built by French prisoners-of-war during the Napoleonic era, and listed as a building of historic or archaeological interest. The Guildhall Library furnished me with a list of sugar-refiners owning the business to 1874, after which year it became a tea warehouse. A recent [1973-4] visit showed the building to have walls intact with iron supporting pillars inside, and that it can be made fit for use again." "Essex and Sugar" by Frank Lewis, Phillimore, 1976. At Tower Hamlets Local History Library, there is a photograph of this same building, 40 Dock St, during the demolition of the left part of it around 1980. 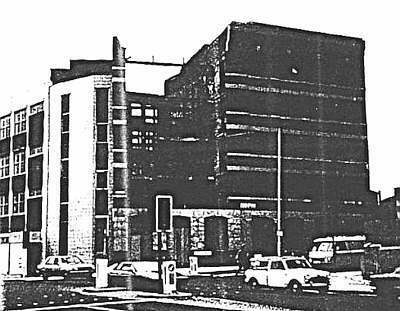 This scan of a b/w photocopy of the original colour print does not do it justice, but the cast iron frame of the otherwise brick building is clearly visible. Image 022 Dock St 1980-1. © Mrs C Ely, Aug 1988. With kind permission of Tower Hamlets Local History Library. The directories of the time show that the refinery was run by Hodgeson & Son (1837), John Hodgeson (1845), and Harrison & Wilson (1857). Visit the Guildhall Library's Collage website to see an illustration of a refinery in Leman St.
Click here, then enter 22763 in the search box. And - John Hall & James Boyd sugar refiners. Relating to property at Breezers Hill/Virginia Street. 1. Lease of a dwelling house, sugarhouse, premises in Breezers Hill. 2. Lease of the above + property in Virginia Street run by Messrs Schultz & Co prior to Holthouse & Detmar. (The schedule was written in continuous script, with only the sub-headings in bolder script. I have re-written the schedule in list form, rearranging it where possible, to make it easier to visualise the buildings. For me the Niccol picture of a sugarhouse also makes visualisation easier. Garret - glazed sash hung twelve squares six iron guards to pulley hole flap to well hole hung glazed sash in roof six squares framed step ladder. First floor - glazed sashes hung twelve squares each seven wooden buttons to ditto two framed dormer doors in roof two iron bolts wood ceiling floor folding flaps to pulley hole hung flap to well hole hung seven strong supports with iron caps. Second floor - nine glazed sashes hung with twelve squares each eighteen wooden buttons glazed skylight in [stove] twelve squares two and a half inch wrought iron bar in [stove] […] walls folding flap to pulley hole with two pair hinges framed nine step ladder nine strong supports with oak caps framed flap to well hole hung. Third floor - eight glazed sashes hung twelve squares each eight wood buttons framed door to double house hung nine strong supports with oak caps to floor folding flaps to pulley hole hung framed nine step ladder framed flap to well hole hung. Fourth floor - seven glazed sashes hung twelve squares each fourteen wood buttons framed door to double house hung small flap in floor six cast iron air gratings in floor folding flap to pulley hole nine step ladder and hand rail nine strong supports to floor with oak caps. Fifth floor - seven glazed sashes hung twelve squares each fourteen wood buttons framed door to double house hung folding flap to pulley hole hung framed nine step ladder nine strong wood supports with oak caps two large iron air gratings in floor. Lump room floor - three glazed sashes hung twelve squares each glazed sash hung six squares five iron guards to windows each four strong wood supports with oak caps folding flap to pulley hole hung framed nine step ladder two uprights and rail to well hole. Warehouse - four glazed sashes hung twelve squares each four buttons to ditto four wrought iron guard bars to each window two pair ledged folding doors with iron bolts and plates and two padlocks nine strong supports to floor glazed sash hung twelve squares framed door to yard hung two bolts weight pulley and line framed folding flap hung two small flaps in floor two glazed sashes fixed in door four squares each wire bars to ditto pair cast iron steps to warehouse. Fill house - five glazed sashes hung twelve squares each four iron bars to each three glazed sashes hung twenty four squares each eight cast iron pillars with oak caps framed door to yard hung with two bolts and plates iron thumb latch and staple framed folding hatch doors to double house hung bolt and plate and two thumb latches, floor paved with York stone in courses. Garret - four glazed sashes hung twelve squares each four buttons to ditto three small flaps in floor two flap doors in ceiling. First floor - four glazed sashes hung twelve squares each four buttons to ditto three small flaps in floor two cast iron columns with oak caps to floor four strong supports against walls. Second floor - four glazed sashes hung twelve squares each eight buttons to ditto three flaps in floor two cast iron columns with oak caps to floor four strong wood supports against walls. Third floor - four glazed sashes hung twelve squares each sixteen buttons to ditto fourteen iron guards to ditto two iron columns with oak caps to floor two flaps in floor. Lump room floor - three glazed sashes hung twelve squares each glazed sash hung six squares ten wrought iron bars to windows eight buttons to ditto two cast iron columns with oak caps two flaps in floor two strong wood supports with oak caps framed door to double house hung iron thumb latch and staple. Warehouse - two glazed sashes twelve squares two ditto nine squares four iron guard bars to ditto flap in floor framed folding door to yard hung two bolts and plates framed folding door to street hung two bolts and plates two iron pillars with oak caps framed folding door to single house hung lock and bolt. Fill house - four glazed sashes hung eight squares each four iron guards to three windows glazed sash hung thirty four squares cast iron pillar with oak cap strong wood support, floor paved with York stone. Stoke hole - floor paved with York stone small boiler house glazed sash fixed twelve squares framed two step ladder to yard. Boiler house - two glazed squares in roof two glazed squares fixed, the brick and wood […] of boiler house with pair framed folding doors hung with bolts and plates thumb latch and staple seal and riser to privy strong wood supports to stage two framed flaps in floor with iron rings and staples framed iron gratings in ditto floor paved with York stone stack of rain water pipe against wall glazed sash hung twelve squares six glazed tiles in roof framed door hung with iron stay and ring. Yard - stack of cast iron rain water pipes with heads from double house and boiler house ditto from boiler house to yard tin gutter to roof of boiler house water pipe from single house to street six cast iron coal gratings pair framed folding gates hung with three bolts and plates iron mortice lock and thumb latch and cast iron spring to ditto, iron scraper to dwelling house cast iron plate in pavement wood water shoot and gutter from dwelling house to yard, the framed wood fence and hatch gate to cellar steps, yard paved with York paving. Second floor front room - two glazed sashes hung twelve squares each brass fastening three closets with doors hung, wood mantle and jambs stone hearth, door to room with lock and key two bolts room plastered. Second floor back room - glazed sash hung twenty squares closet with door wood mantle and jambs and stone hearth door to room hung with lock and key walls plastered and whitened. Landing - glazed skylight walls plastered part wainscot. First floor front room - two glazed sashes hung twelve squares each two closets with doors hung, wood mantle and jambs and stone hearth door to room hung lock and key two bolts and staples walls painted and coloured skirting round room. First floor back room - glazed sash hung twenty squares closet with door hung wood mantle and jambs and stone hearth door to room hung with lock and key, walls plastered skirting round room. Ground floor parlour - glazed sash hung twenty squares closet with panel door hung stone mantle and jambs and stone hearth, pair folding outside shutters with two bolts and plates door to room hung with lock and key walls plastered and part wainscot. Kitchen - glazed sash hung twenty squares stone jambs and mantle and stone hearth, door to cellar hung three bolts and iron thumb latch, framed door to yard hung iron thumb latch, Portland stone sink with brass taps door to passage hung wainscot dresser three drawers potboard under nest three shelves over, pair outside folding shutters hung three bolts and plates door to street hung iron lock and key two bolts walls plastered part wainscot. Beer cellar - glazed sash fixed three squares seven wrought iron guards folding door hung lock and key two bolts. Third floor left hand room - glazed sash hung sixteen squares brass fastening closet with door iron button door to room hung with lock and key and iron bolt walls plastered. Third floor right hand room - glazed sash hung sixteen squares brass fastening closet with door with lock door to room hung with lock and key walls plastered. Landing - glazed sash hung sixteen squares brass fastening. Second floor left hand room - glazed sash hung sixteen squares stone hearth closet with door iron button lock and key door to room hung with lock and key walls plastered. Second floor right hand room - two glazed sashes hung twelve squares each two brass fastenings two closets with doors hung locks and keys stone hearth door to room hung lock and key walls plastered. Landing - glazed sash hung twelve squares. First floor left hand room - glazed sash hung twelve squares brass fastenings closet with door lock and brass knob stone hearth and stone mantle and jambs, pair inside three fold shutters hung with iron bar fastening, door to room hung with lock and key walls lined. First floor right hand room - three glazed sashes hung twelve squares each three brass fastenings three pair two fold inside shutters hung with bar fastenings and brass knobs veined marble mantle and jambs marble hearth door to room hung brass mortice lock and key brass handles, room papered and painted. Landing - glazed sash hung twelve squares brass fastening pair two fold inside shutters hung iron bar two brass knobs hatch gate top of stairs hung brass thumb latch. Ground floor left front room - glazed sash hung twelve squares brass fastenings pair outside shutters hung two bolts and plates stone mantel and jambs and stone hearth three closets with doors locks and keys, door to room hung mortice lock brass handles and escutcheon. Ground floor right front room - three glazed sashes hung twelve squares three brass fastenings three pair two fold inside shutters hung iron bars and brass knobs to each three pair outside shutters hung two iron bolts and plate and stay to each marble mantle and jambs and marble hearth two cupboards with doors hung locks and keys door to room hung brass mortice lock and key brass handles walls canvassed and painted. Hall - framed ironwork glazed solar, door to street hung iron lock key chain and spiral and two bolts and plates iron knocker and plate. Cellar - glazed sash fixed twenty seven lights iron guards to ditto enclosure to stairs with door folding door to street banded with iron and iron bolts and plates. Pantry - glazed sash hung twenty four lights, the wood divisions of pantry, two closets with door hung two doors to ditto hung locks and keys. Wine cellar - door hung with lock and key glazed sash hung four squares. Kitchen - glazed sash hung sixteen squares pair two fold inside shutters with wood bar wood sink lined with lead cupboard under, cast iron column and head, stone mantel and jamb and stone hearth and stone paving round sink and entrance, door to room hung lock and key door to cellar hung lock and key thumb latch and two bolts and plates and iron bar and staples door to stairs hung lock and key door to yard hung thumb latch two bolts and plates spring latch and iron knocker and plate weight line and pulley to ditto door to cupboard. Room over - glazed sash hung sixteen squares four iron guard bars brick hearth walls plastered. Room over - glazed sash hung six squares walls plastered. Counting house - glazed octagon skylight forty eight squares […] and pulleys to ditto glazed sash hung sixteen squares pair two fold inside shutters hung iron pin stone mantle and jambs stone hearth door to yard hung iron lock and key walls painted. Sample room - glazed sash hung sixteen squares door to yard hung iron latch door to counting house two bolts. Brew house - glazed sash hung sixteen squares three glazed tiles in [roof] wood stage next water closet two strong […] doors to yard hung iron latch brass handles walls whitened floor paved with York stone. Water closet - the wood enclosure to two sides of water closet seal riser and flap iron lift and brass handle door hung bolt brass handle and iron hold. Outside - stack rain water pipes from men's dwelling to street two wrought iron stays and plates to chimney of principal dwelling iron scrape to ditto, ditto to men' dwelling two iron gratings to cellar windows stack rainwater pipe from dwelling house to street two stacks ditto from sugarhouse to street two iron gratings to fill house windows wood flap hung to beer cellar principal dwelling. 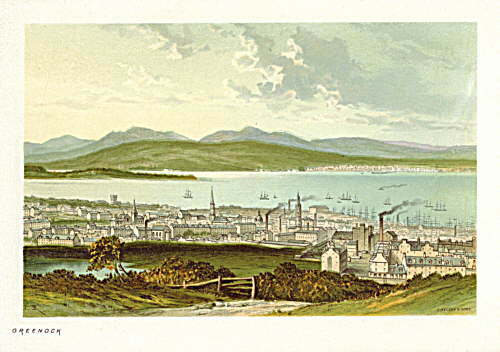 GREENOCK - View of refineries and river - late 19th century. Berryyards Refinery in the foreground, and others far left and far right of picture. Later to become the Westburn Refinery of Messrs Tate & Lyle. © McLean Museum & Art Gallery, Inverclyde Council. GREENOCK - Roxburgh St refinery. - original postcard. ..... and probably the aftermath. © McLean Museum & Art Gallery, Inverclyde Council..
GREENOCK - The old sugar warehouses at James Watt Dock, 2007. I'm very grateful to Andrea Brown for these two recent pictures. was announced on BBC News. In Back [Church] Lane, Whitechapel. One of a series of beautifully preserved plans, at LMA, shows a dwelling house adjacent to the site of an old sugar house. Behind the two is shown the new sugar house, measuring 54 feet square. This was probably the premises of John Hodgson, 1810. Fairrie & Co. Ltd., Liverpool. At the PRO is a bundle of documents referring to Share Ownership, etc, of the Limited Company, 1866 - 1931. On 15 May 1866 the Articles of Association showed Share Capital as £120,000, divided into 100 shares of £1200. The initial sale of shares resulted in 86 being purchased, mostly by the Fairrie family, holding a small majority over the Macfie family. The Macfie family appear to have become majority share holders in 1877, and by 1892 held a larger majority. The Registered Office was at Colonial Buildings, 36 Dale St, Liverpool, in 1866, and in 1904 was at Palace Chambers, 21 Victoria St, Liverpool, with James Fairrie as MD. The Mortgage Register shows premises at : Vauxhall Rd, Raymond St, Hornby St, Victoria St, Black Diamond St, land adjacent to Leeds & Liverpool Canal, Green St, Portland St, Burlington St (warehouses & stables). At an Extraordinary Meeting on 2 Aug 1929 a resolution was duly passed … “That Fairrie & Co Ltd be wound up voluntarily and that a liquidator be appointed for the purpose of winding up”. On 18 May 1931 an Extraordinary Resolution was duly passed which … “Resolved that the books and documents of the Company and of the Liquidator thereof be retained by the said Liquidator, he undertaking to have then destroyed at the dissolution of the Company”, and the company was finally wound up on that day. From BT 31/14384/3063 at PRO, London. BRISTOL - St John's Bridge Sugar House still stands - now a hotel. St John's Bridge Sugar House, approx 1728-1832, in Lewins Mead, Bristol; now the Hotel du Vin & Bistro. or view the location "J" on the map. Gt Alie Street / Half Moon Passage - Plan of Craven & Bowman Refinery, 1856. This site appears to have passed to Arthur Craven & Frederick Bowman on the death of John Craven in 1856.
for the erection of a spacious block of warehouses". TH5540 & TH5573 Tower Hamlets Local History Library. BRISTOL - Plan of part of Finzel's Refinery, Counterslip, 24 April 1879. "Copy of Part of Plan, on a Deed, of Refinery of Finzel & Co, Counterslip, Bristol, 24 April 1879." - BRO 36772 Box 6. With kind permission of Bristol Record Office. developed the site after acquiring it in 1839, and seeing it destroyed by fire in 1846. It was rebuilt on a large scale, at a cost of £250,000, and was claimed to be the largest refinery in the country. The 1851 census (HO107/1947) shows they employed 202 men, however at its peak over 700 men worked there. It closed in 1881.
and ... "Sugar-making at the Counterslip Refinery, Bristol". 1873. "Sugar-making at the Counterslip Refinery, Bristol." - W B Murray. - The Illustrated London News, 29 Nov 1873. Read the excellent article with which this picture was printed. View the location - "C" on the map. DETAILED SECTION - of a refinery designed to produce centrifugal sugars ... c1888.
" Refineries are usually seven or eight stories high, and the sugar having been hoisted to the top-most floor, descends by gravitation during the different processes, so that the operation of pumping is, to a great extent, avoided. Sometimes however, a refinery is constructed with only three or four stories, and then it is necessary to frequently raise the liquor by means of a pump or monte-jus, from one stage of the process to another. Plate XIII [above], gives a general idea of a sugar refinery, as designed by Duncan Stewart & Co, Glasgow, to turn out centrifugal sugars; it is useful as showing the relative position of the various apparatus which are described later in detail. 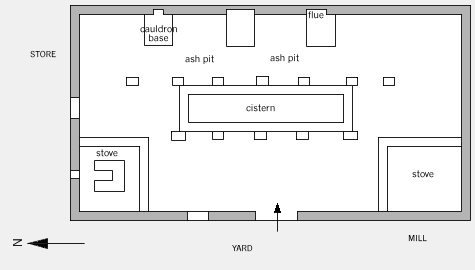 The building is set in two parts: one containing the char cisterns, and the other the rest of the refining plant, as may be seen by reference to the following letters .... A, hopper to which the char from the kilns (situated in another building, and not shown in the illustration) is conveyed. B, conveyer delivering the char into C, receiving tank, from which it is delivered to any pipe. D, a short pipe being temporarily attached to the end of these pipes, leading to the cisterns during the filling operation. E, char cisterns. F, wet char bands, delivering char from cisterns to kilns. G, water-tank forming the roof of the refinery. H, garret. I, melting pans, or blow-ups. J, steaming tank for washing empty packages. K, Taylor filters. L1 tanks for washing filter bags. L2 raw liquor tanks. M vacuum pan. N, vacuum pump. O, heaters. P, refined liquor and syrup tanks. Q, centrifugal machines. R, tanks for receiving syrup from centrifugal machine. S, water pump and engine for driving same." From "SUGAR - A Handbook for Planters & Refiners" by Lock & Newland Bros. 1888. The Tenure and Occupancy of the Sugar House in Angel Alley, Whitechapel. 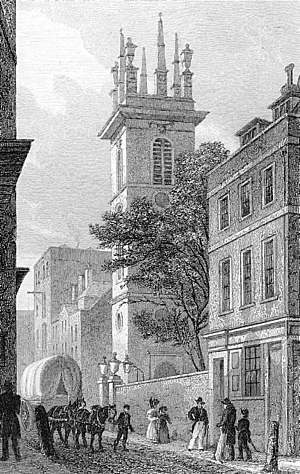 1733, March, JOHN BROMWELL, sugar refiner of St Mary Whitechapel,	leased property for the purpose of refining sugar in Angel Alley, Whitechapel from John Ingold. The property included a messuage, workshop, yard and garden. The lease was for 21 or 61 yrs; it was confirmed as continuing until 1749. 1759, March 19, Messrs SCHEVE & ARNEY leased the premises to Mr SUHRING. Those involved were: JOHN CHRISTIAN SUHRING, sugar refiner, JOHN TITIEN, sugar refiner, JOHN ARNEY, sugar refiner, and JOHN SCHEVE. £2000. Soon after the premises was leased to JOHN SCHEVE by JOHN ARNEY. 1765, JOHN ARNEY & JOHN HENRY SUHRING leased the premises to JOHN CHRISTIAN SUHRING for one year, on the death of JOHN SCHEVE. JHS was an executor of his will. 1772, John Aylett Stow leased to Messrs JH & JC SUHRING. 1772, Stow leased to the SUHRINGs the house and premises in George Yard, adjoining the plot in Angel Alley, late occupied by Mr Moffatt. 1792, piece of land situate in Angel Alley, Whitechapel, whereupon stands a Sugar House, shed, divers other offices belonging to tenure and occupation of JOHN CHRISTIAN SUHRING, and now in tenure and occupation of Messrs SAMLER & FERRERS. Leased to GEORGE COOPER by John Gask and Charles Wilmot for a peppercorn rent. Then passed to THOMAS COOPER on death of George in 1800. The Use of Wrought-Iron Beams. William Fairbairn wrote between 1864 and 1870 ... "...., I have had several opportunities of testing the value of wrought-iron beams; and in proof of their greater security and adaptation for building such as mills, warehouses, etc, where great weights have to be supported, I have selected a fire-proof building, eight stories high, erected for Messrs Bewley, Moss & Co, for illustration. It is built for a sugar refinery, and the weights these floors and beams have to sustain, when loaded with moist sugar, has been calculated at 400lbs on a square foot, and the breaking weight of the beams is computed at 106 tons equally distributed. This building is probably one of the most important yet constructed with arches in wrought-iron beams, and we here refer to it as an example of what may be done by the introduction of a material free from flaws and much lighter than cast iron. ..... the building is about 150 feet long, and 58 feet wide with only one row of columns down the centre of the main building, ....". From 'On the application of cast and wrought iron to building purposes', by William Fairbairn, 4th edition 1870, pp183. Refinery Design & Construction, 1783.
" Sugar house, is a brick or stone building, constructed for a sugar refinery manufactory. A house intended to contain one or two pans should be square or nearly square: but a house of larger dimensions ought to be of an oblong form; as it may be conveniently heated, by placing the chimney of the stove and of the pans at opposite angles. A house to contain one pan should consist of six floors besides the ground floor; the dimensions about twenty seven feet square: the two pan house about thirty six feet by forty feet: a house of four pans about forty feet by sixty or sixty five feet. The stove is a brick building from eight to fourteen feet square, usually placed in one corner of the building. The height of the several stories should be as follows: the fill house, or the ground floor, nine feet below the girders; the next floor above it, called the warehouse, of the same height: and every other floor upwards, six feet at most between the girders and floor. In every floor must be left an aperture, through which a rope is suspended upon a brass pulley on the uppermost floor for drawing up the sugar; and provided due attention be given to the strength of the building, and to the exclusion of damps and a cold air, a sugar house cannot be rendered too light. The utensils necessary to a sugar house are of copper, lead, iron, carpentry, back-maker's work, wicker-work, pottery, etc.. The copper utensils are the pans, coolers, cisterns, syrup pipes, basons, ladles, skimmers, and, in some cases, candy pots, etc.. The pans are usually made of conic form, five or six feet diameter at the top, decreasing to a diameter of about two feet six inches, or three feet. The coolers are vessels of thin copper of six feet in diameter, and about twenty inches high: the number of pans and coolers is usually the same. The clarifying cistern is a larger receiver either of copper or lead, placed as near as possible to the sides of the pans, and capable of containing at least one third more than the contents of all the pans collectively. The syrup pipes are tubes of four inches diameter, made of thin copper, or tin plates, and suspended perpendicularly over the clarifying cistern, from the upper floor through the whole building. The basons our vessels, containing four to six gallons each, in which the boiled sugar is carried from the pans to the coolers, and from the coolers to the moulds. The ladles are of several sizes. Skimmers are of fourteen inches diameter, pierced with holes like a cullender; and likewise a small one of the same kind. Cullenders are of eighteen inches diameter, and fourteen inches deep, through which the clay is to be strained: and there is also another, which is smaller, for the purpose of straining spice. The leaden utensils and plumbers ware, are such as follow: the bench is a ledge about one foot broad, running before the pans, and rising in front, whereby it is capable of receiving the sugar which is spilled before the pans. The scum cistern is a wooden receiver, usually lined with lead, and nearly as large as the clarifying cistern. The water pipes are pewter or hard metal pipe from the lime cistern to the pans, and leaden pipes for the conveyance of common water or liquor to the pans, and to the lime cisterns. The pumps are a copper pump fixed in the clarifying cistern, and a spare pump of the same kind. The iron-founder supplies bars of a triangular form to be laid under the pans, and the cockell, which is an iron trunk, used to dry the goods in the stove; and also iron doors, stove door, and pan doors, etc.. The carpenter raises the steam vent over the pans, which is a hood of thin boards, so formed as to conduct the steam to the two brick funnels, which are led up on either side of the pan chimney to the top. He also furnishes the racks of the stove, a trough to convey the sugar from the pans to the cistern, and another to return it from the cistern to the pans, syrup stools, blocks, cooler oars, etc.. The back-makers supply two or more tubs or backs for lime water, which are round, overall, or square, and whose capacity varies from thirty to two hundred barrels. The liquor-back, is any vessel large enough to hold a considerable quantity of common water. The mould cistern is a large oblong vessel, in which the moulds are soaked before they are used: it is usually about four feet six inches deep, and should be capable of containing at once as many moulds as are used in one day's refining. The clay cisterns are supplied either by the back-maker or carpenter, and also at the clay star, which is made of oak or elm, its club end being stuck full of iron points: its use is to macerate and fine the clay. The wicker-work consists of refining baskets, scum baskets, pulling up baskets, coal and clay baskets, etc.. The sugar mill is one of the most simple machines of the kind: the runner is sometimes made of cast iron and sometimes of stone: the former is preferable, because a large diameter and a broader surface may be had with the same weight. The runner and the centre post should have a brass collet within them, for the iron spindle to turn upon. The mill should stand on a solid foundation; either on the earth, or on the centre of a brick or stone arch. The vessels of pottery are of various sizes, and of two different forms and denominations, viz. pots and moulds. The construction of the pan chimney requires peculiar attention; it should be placed on iron bases, and the horizontal bars on which it rests must be wrought in the walls of the building, and clenched down on the outside. But the setting of the pans is the most difficult work; for it is necessary, that they should be so fixed, as that the stones, which burn away under them three or four times a year, should be taken out and replaced, without pulling down the whole work. After all, a principal consideration in the construction of a sugar house, is the obtaining a sufficient degree of heat. Various degrees of heat are required for different sorts of goods, and occasionally for the same sort: accordingly each floor may be made more or less warm as the case requires. The heat is introduced through the pan chimney, the stove chimney, and sometimes through iron or brick flues raised on purpose. It is communicated from the chimneys by shutting the register-plates, after the fires are extinguished, or when they are nearly out, and the remaining ashes are perfectly clear. After shutting the register-plates, the small iron doors (one of which is fixed in the chimneys both of the cockell and the pans upon every floor) are opened, to convey heat where it is wanted. Labourers in sugar houses are very subject to dysentries: the vitrum antimonii ceratum is an effectual remedy in these cases. " From Chambers Cyclopaedia, London, 1783. .... and 20C photographs show the building to have been of 7 storeys above ground. Evidence of boiling pans with ash pits along a longer wall, two stoves, and a central cistern were found, and archived plans and documents show associated cooperage, raw sugar store, sugar mill, and dwelling house. Source : 'Sugar Refining in Southampton' by J.C.Drake of Southampton Museum of Archaeology. Further details on Southampton Sugar House page. The LMA has a set of original plans [MBO/PLANS/440-2] drawn by C Dyson, Surveyor of Stratford Grove, undated but probably 1851, for an addition to the sugar house of Mr John Wagener of Well St, Wellclose Square, which appears to be in Well Street but attached to his sugar house at 27 Wellclose Square. The addition appears to be similar to the main sugar house ... 6 storeys high (53ft 9in) above ground, with a boiler house in the basement, with each floor having access to the main sugar house. Built upon concrete foundations 4ft wide and 2ft 6ins deep, the walls are 1ft 11ins thick reducing to 1ft 6ins thick for the upper storeys. Similarly the headroom on the ground floor is 8ft 6ins reducing gradually to 7ft on the top floor. There are two boilers, one 28ft long and 7ft diameter, the other 19ft long and 4ft 6ins diameter. The addition is of brick and timber construction with the size of each floor being about 26ft square, with each floor supported by 6 wooden posts evenly spaced. 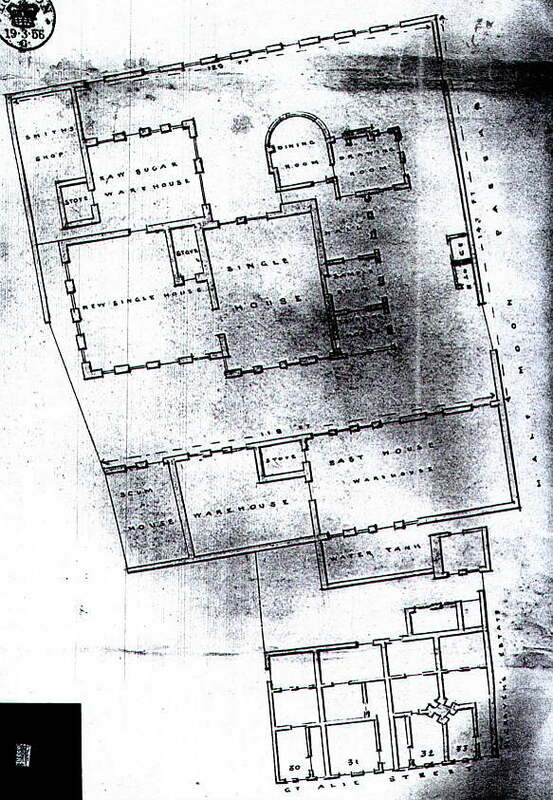 These plans are drawn on tracing paper, and gently colour-washed. Source : MBO/PLANS/440-2 at LMA, London. The Businesses of Thomas Slack. (A) Lease of 21 June 1766 between (1) James Spalding grocer of St Mary Whitechapel (2) Thomas Slack gent [sugar refiner] of St Margaret Pattens (3) Mark Downing sugar refiner of St Mary Whitechapel to be in partnership in business as sugar refiners. The site obtained was of messuages & out-buildings situate on the north side of Goodman's Yard and the west side of Mansell St in St Mary Whitechapel. Edward Hawkins was directed to pull down the existing buildings, with the exception of two occupied houses currently in tenure, before 29 September and completely finish a sugarhouse on the same piece of land as well as repair the 2 remaining houses. He was then to grant a lease for the land, sugarhouse, and two houses to the above. i. Lease for 7 yrs to carry out art trade mystery and business of sugar refining. ii. To make up the joint starting capital of £7500 by 25 December. iii. Agreed that sugarhouse to be erected by Edward Hawkins. iv. Agreed that joint partners should be true and faithful to one another, and carry out joint trade, though James Spalding not obliged to attend the affairs and business. v. Interests, capital, etc. in one third units. vi. All details of trade to be kept in books in the counting house. vii. All dealings to be made in the name of Thomas Slack & Mark Downing & Company. (B) Lease of 1777 between James Spalding, Thomas Slack and John Hawes. Thomas Slack of Gravel Lane ... partnership ... 3 sugarhouses & large warehouse ... mens room, dwelling house of Thomas Slack ... under several leases ... north side of Goodman's Yard and west side of Mansell St ... under lease to James Spalding, Thomas Slack and John Hawes dated 31 Mar 1776.
i. To become joint traders in the business of sugar refining for a further term of 14 yrs & 13 days carried out in the sugarhouses and premises under the two company names of Thomas Slack & Co at Gravel Lane and John Hawes & Co at Goodman's Yard. ii. Capital stock of joint trade increased to £42,000 in equal shares. £20,000 at Gravel Lane, £22,000 at Goodman's Yard. iii. If either partner wishes to dissolve the partnership after 7 yrs, then they must give 6 months notice. iv. The said parties are engaged in partnership with William Walker sugar refiner in his sugarhouse in Whitecross St, St Luke's, under the terms - ½ expenditure / ½ profit - and this should continue. Source : CR 611/435/1 & 3 at Warwickshire Record Office. 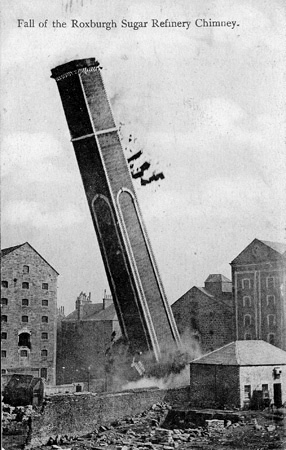 HULL - A Fatal Disaster - 1868. The Old Sugar House, Lime Street, Hull - from The Illustrated London News, 1868. THE FATAL DISASTER AT HULL. ...... cooperage. Eight were killed by the fall of the building, five of them being coopers. Many theories have been put forward to account for the fall of the buliding. It has been said that the timbers were unsound; but this is denied, and the premises were inspected only two or three days before. Within the same week another gentleman examined the upper story, and found no appearance which would justify the assumption that the foundation had given way. His impression was that the rooms had been filled too much with grain, and that the seed escaping into the lower rooms increased the bulk to such an extent that the flooring had burst, and at last the wall was forced out. This theory seems to derive much probability from the statements made by eye-witnesses of the calamity. It is said that the upper rooms seemed momentarily suspended in the air, whilst the lower rooms fell bodily. The most singular circumstance is that the disaster was indicated beforehand for some minutes by the seed falling out of the windows. This circumstance was immediately noticed and communicated to those who worked on the premises; and it seems that the men were leaving the premises at the time the building fell. The coopers were nearest the main entrance, and as soon as they heard the loud rumbling that unmistakably warned them of the disaster they made for the door, but ere they could escape the upper part of the structure fell with an awful crash upon the cooperage, and they were buried beneath the ruins. The names of the seven men dead are Watkinson, Rodman, Hombler, Harrison, and Gillett, coopers; Watson, who was employed in the top room; and Smith, who had been working outside the building. It was known that there were two boys at play in Lime Street when the building fell. A day or two afterwards the body of one was found. It was that of John Brewer, six years of age, son of George Brewer, an oil miller, in the employ of Messrs. Walker & Smith. The child was last seen alive about twenty minutes past eleven o'clock in the morning, near the Old Sugar House, with a youth named William Cato, who was subsequently got out of the ruins, escaping with but slight injury. Mr Smith, one of the owners, positively states that there were not more than 10,000qrs of linseed in the building at the time. Some minutes before the accident it was noticed that the pressure of the seed had occasioned the breakage of some windows, and joiners were sent for to batten them up. Happily, they had not got to work, or they might have been numbered among the dead. On Saturday afternoon the inquest on the bodies was opened, but it was adjourned, after some formal evidence had been given, for three weeks. 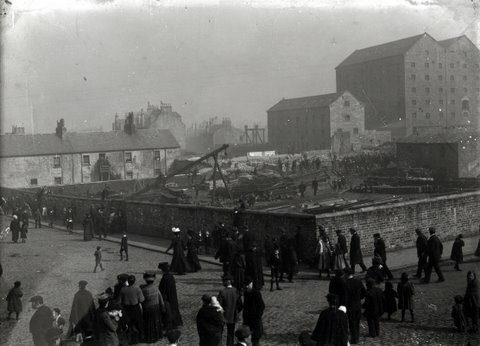 The newspaper reports at the time gave considerable detail regarding the hours before the collapse, the falling of the building and the rescue attempts made throughout the afternoon. The inquest on the eight who died, one of whom was a 6 year old boy just passing the building, concluded that the collapse was caused by the overloading of a building already weakened by decades of subsidence of the pillars and foundations that held the lower floor. The jury gave a verdict of 'Accidental death from the fall of a warehouse', and suggested that all such old buildings that were to be converted to store seed should be inspected by the Board of Health for their suitability. 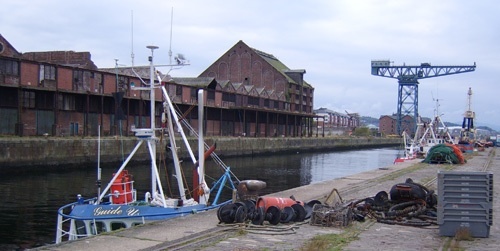 -- (from 'A History of Kingston upon Hull by Hugh Calvert, Phillimore, p.205) "The first and largest factory in Hull during the 18th century was the sugar house built in 1731 eight storeys (74 feet) high on the east bank of the [River] Hull above the North Bridge. 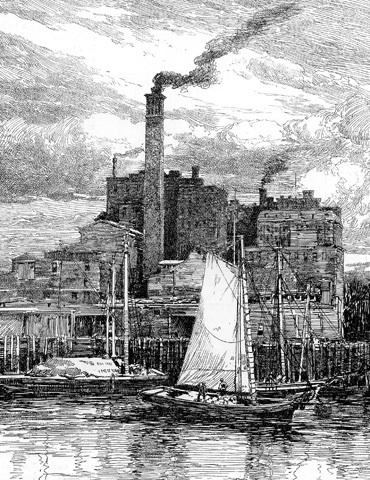 Its owners had hoped to tranship raw West Indian sugar from London for refining in Hull, but the advantages of the Thames-side refineries upon whose wharves the West Indian cargoes were discharged never allowed the Hull refinery to compete on a profitable basis and failed almost immediately." On the contrary ... whilst I cannot say whether it made any sort of reasonable profit, this sugarhouse was in business from 1732 to 1840, with the Thornton family of London merchants involved throughout. This was not, however, Hull's first refinery - there were 2 in the previous century, with the one at South End (VCH, p.168.) 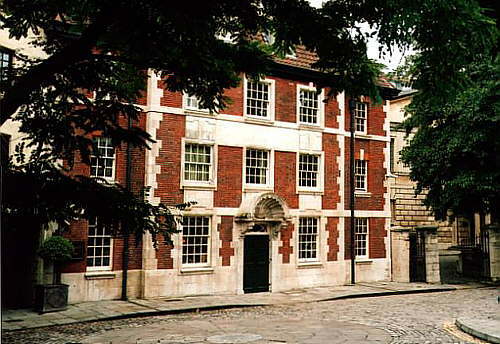 and one on Trippet described as "one great building of brick" (Hull City Archives - M688 - BRN/384-5). View the location map and much more detail of the Lime St site. The Rhinelander Sugar House, New York. The name refers to the wealthy Rhinelander family, owners of the building from 1790-1892, although it was actually built by Henry Cuyler in 1763. Henry died in 1770, and his sons Barent Rynders (died 1770) & Henry (died 1776) took over for a short time. The superb photographs (see Source) that exist of this sugar house show a large, solid, almost indestructible 7-storey stone building. There is an unlikely suggestion that the building was used as a prison during the Revolution, but no proof as yet. Built on the corner of Rose and Duane Streets, the sugar house was finally demolished in 1892, and an original window was preserved and built into the facade of the new Rhinelander Building. When this was demolished in 1968, the window was built into a facade behind the Municipal Building at Chambers and Centre Streets, some 100 yds from its original site which is now beneath the access ramps between Brooklyn Bridge and FDR Drive. A second window was salvaged from the Rhinelander sugar house and erected in an enclosure beside the Van Cortlandt House in the Bronx. Van Cortlandt was another early New York refiner along with Livingston, Roosevelt, and Bayard, who was probably the earliest. Source : The Museum of the City of New York ... however Museum policy will only permit me to use their on-line picture(s) for a limited period and after payment of a fee. It is a pity it cannot see past its policy to the mutual benefits to be gained. However, "A Century of Sugar Refining in the United States 1816-1916" (The American Sugar Refining Company 1916) does have a picture, showing the main refinery building to the right (and soldiers nearby !!). Lancaster - Refinery in St Leonard's Gate. 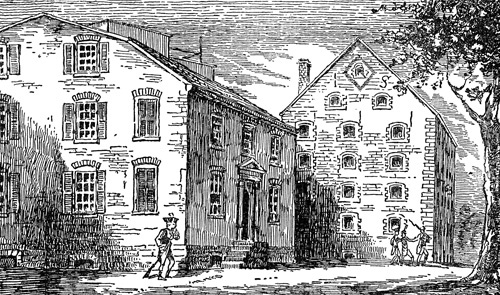 In February 1766, Robert Foxcroft of Lancaster leased his sugarhouse and land plus dwelling house on the NW side of St Leonard's Gate to five Lancaster gentlemen namely Robert Lawson, Abraham Rawlinson, Henry Hargreaves, Miles Birkett, and George Foxcroft, and Luke Astley a grocer of Preston. The whole, possibly known as the Sugarhouse Company, being divided equally into six shares. In 1769, Lawson, Rawlinson and Hargreaves bought out Birkett and Foxcroft, and in 1772 Rawlinson and Hargreaves bought the Astley share. A directory entry of 1793-8 shows the refinery belonging to James Hargraves, Henry's son (see will). The various deeds describe a dwelling house and brewhouse fronting St Leonard's Gate, and behind these on the plot which extended back to the mill race of Lancaster Mill stood the sugarhouse, offices, warehouses and other associated buildings, however the plan on document L245(b) shows the dwelling house at No.1 St Leonard's Gate, with 2, 3 etc going north-east. The "Sugar House Land" is shown adjoining No.1 to the south-west and going back to a "Green Area". No details of the sugar house itself are given. Sources : Manchester Archives & Local Studies - Refs : L245, L246, L247. MONTREAL - Redpath's Canada Sugar Refinery. The Canada Sugar Refinery was built next to the Lachine Canal by Scotsman John Redpath in 1854, and was at one time the largest plant in Montreal. 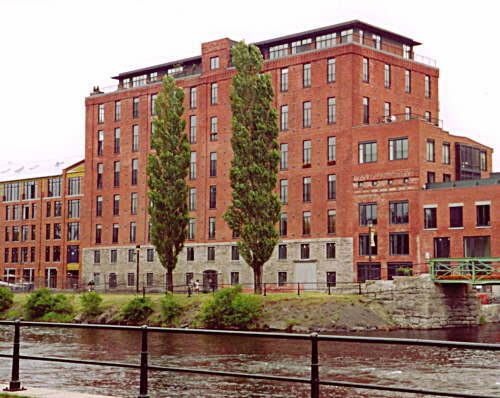 With the canal now re-opened for pleasure boats, the refinery building is being converted into high quality apartments. There is evidence that 48 Wellclose Square, St George's in the East, was used as a sugar refinery from 1794 to 1851 by, in turn, Pritzler, Engell, Martineau, and Henrickson (see map), though maybe even much earlier as premises were not given numbers in the references before that. The censuses of 1861 and 1871 still show no.48 as a sugarhouse, but in 1881 both 48 & 49 were uninhabited. 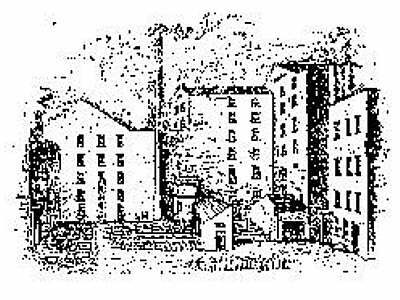 In the mid-1870s we know that the sugarhouse buildings, as shown in the picture, were being used as a Pickle Factory by George Whybrow. He and others of the Whybrow name where oilmen and oil importers from the 1840s through to the end of the century. The picture is taken from an advertisement of about 1875 ... click here to see it in full. 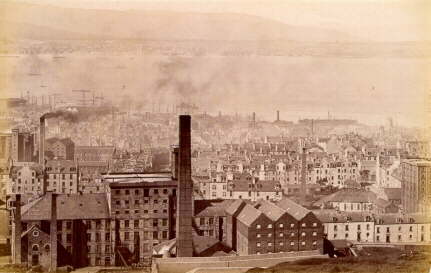 1873 - "Cappielow Sugar Refinery, Greenock - Extensive building operations have been going on in this refinery for some time, and lately there was supplied to it a very large boiler from the Lillybank Boiler Works, Glasgow (Messers. William Wilson & Co.) It is fitted with Bowling patent weldless rings and Galloway tubes, and is altogether a fine specimen of skilled workmanship." 1877 - "Fires. - One was at Cappielow Sugar Refinery, Greenock, an establishment which dates back to 1833. The damage is set down at about 50,000 l. But this is not the first occasion for the same refinery to suffer by fire. * Nov 19th 1725 - Wm Collyer Cn & Joyner - in possession of Ed Wynn. £300 on a brick sugar house 7 storys high situate on the west side of Rupert Street in Goodmans Fields in the parish of St Mary Whitechapel. Renewed by same 17 Nov 1732. * Nov 17th 1732 - Wm Collyer Cn & Joyner - in possession of Capt Partis. Brick house value £300 being a sugar house with and apartment backyard val £125 situate on the west side of Rupert street in Goodman's Fields in parish of St Mary Whitechapel abut north on Hartop and south on Wood. Renewed by same 12 Nov 1739. * Nov 12th 1739 - Wm Collyer Cn & Joyner - in possession of Captain Partis. On a brick building being 6 stories high being a sugar house valued £300 and an apartment backward valued £125 on the west side of Rupert Street in Goodman's Fields in the parish of St Mary Whitechapel abutting north on Hartop and south on Matthew Wood. Sugar House 25x25 - 625 sq ft. Apartment backward 34x23 - 782 sq ft. Renewed 12 December 1746 by Thomas Cheek. * Dec 12th 1746 - Thomas Cheek Cit & Plasterer - in possession of Long. On a brick building being a sugar house and an apartment backward valued as by margent on the west side of Rupert Street in Goodman's Fields in the parish of St Mary Whitechapel abutting north on Hartop and south on Matthew Wood. Sugar House 25x25 - 625 sq ft. Apartment backward 34x23 - 782 sq ft. Renewed 15 December 1753 by Thomas Cheek. * Dec 15th 1753 - Thomas Cheek Cit & Plasterer - in possession of Long. On a brick building being a sugar house valued £300 and an apartment backward valued £125 on the west side of Rupert Street in Goodman's Fields in the parish aforesaid abutting north on Hartop and south on Matthew Wood. Sugar House 25x25 - 625 sq ft. Apartment backward 34x23 - 782 sq ft. There is evidence of a sugarhouse in Stockton from about 1780. 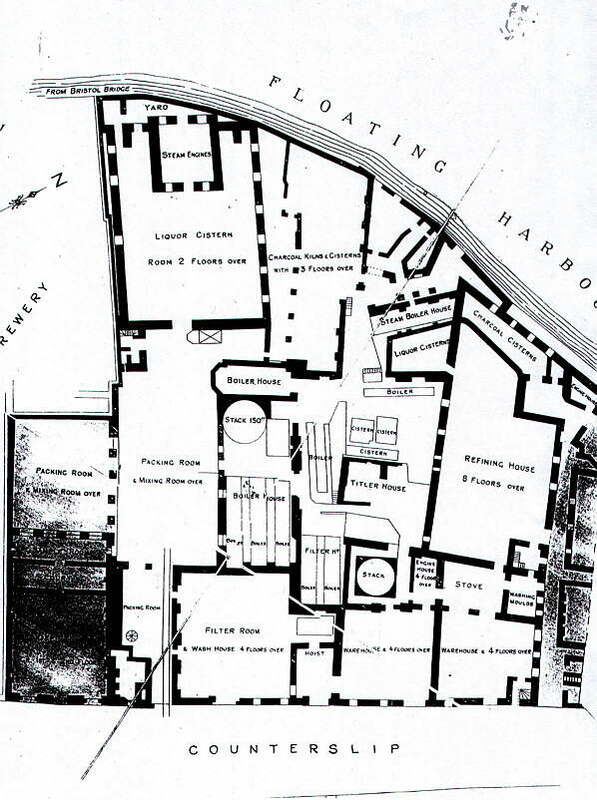 It was built in a street named "Sugar House Open" close to the quayside (see map). It was later used in turn as a lead mill, granary and warehouse. 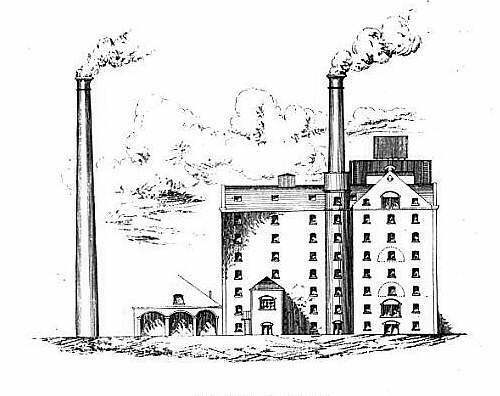 Just when the sugar business ceased, who owned/ran the refinery and when the building was given its name Waterloo Mills, is not totally clear, though all the info I have is on the map page. The PictureStockton website has 2 versions of the same picture of the building a few years before its demolition in 1929. Click picture 1 / picture 2. If anyone can offer any further info, it would be gratefully received. "There is no doubt but that many of our readers have often looked with surprise at the very hight of the sugar refineries of the present day, as may be seen in New York and its suburbs, and also in various other parts of the United States. The reason of this increasing hight is simply that experience has proved that such a construction accomplishes an enormous amount of saving in time and labor; and when the problem consists in handling of large amounts of bulky materials, this is of the utmost importance, especially as by the ever active competition in this business the profits are calculated by fractions of cents, and such establishments can only be made to pay by continually treating great amounts of material - say millions of pounds. For this reason all refineries that were not situated at a water front have gradually been abandoned - either suspended or the owners wisely removing them to a locality where the thousands of barrels of raw sugar and plantation molasses, of animal charcoal, and the hundreds of tons of coal for fuel (of which the consumption in a refinery using steam-engines of 2000, 3000 or more horse-power, is quite large) can be received and shipped without expensive handling. 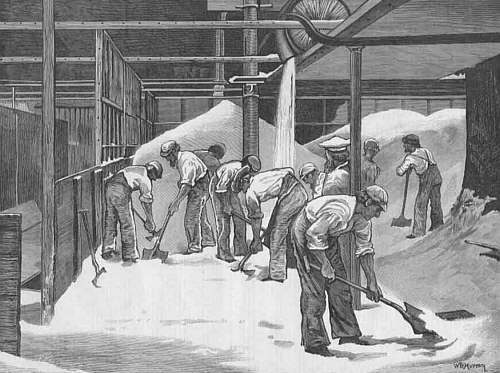 All the sugar refineries now in operation in New York, Brooklyn, and Jersey City, are situated at the water fronts, where they receive their material directly from the ships and boats, and send most of it off in the same way. ..."
Extract from: The Manufacturer and Builder, Vol 0009, Issue 9, Sep 1877. "... The great refineries which line the water-front of Brooklyn and Jersey City are enormous piles of brick, often more than a hundred feet high, with a dozen or more rows of windows one above the other, with no pretentions to architectural show, but by their very size and massiveness making an impressive feature of the river landscape. They are contrived so as to take the sugar as it is landed, and carry it through one process after another with the least possible waste of power, time, and space, until the 'shining sand' emerges purified and ready for consumption. Accordingly the refineries are alongside deep water, and at their wharves vessels of all sorts, from West Indian coasters to the great steam 'tramps' that roam the world over in search of a job, may be seen, three and four together, unloading their cargoes into the voracious maw of the great cook-shop. ..."
Extract and Image from: "A Lump of Sugar", Harper's New Monthly Magazine, Vol 73, Issue 433, Jun 1886. The second extract and its accompanying image are from my own copy of the article, however the full texts of both magazines can be found on the website of Cornell University Library - Making of America. An early location in London. and the said Joanna Brandon to be paid 5/- a week for the maintenance of the said Scott." From: Middlesex County Records. Sessions Book 550 - January 1698 - p.46. Edinburgh, I had always thought, had two sugarhouses, but on closer inspection, the earlier was actually a warehouse, a shop, an outlet in the city for the sugars of the South Sugar House of Glasgow. The St Christopher Sugar Warehouse is the only one of its kind I've found to date. The Newcastle Courant of 1722 spoke of a Mr Bagnall being "the greatest sugar baker in Europe", and the Daily Post of 1729 said in his obit that he was "formerly one of the greatest sugar-bakers in England". MORTLAKE ... Lease bought in June 1714 for 17yrs at £61pa. Paid for building and repairs about £500. 2yrs rent was allowed towards repairs. BATTERSEA ... Bought in 1710 for £700. Paid for building and repairs £400. WESTMINSTER ... Lease bought in March 1699 for 37yrs at £32pa. Paid for building and repairs £600. PAULS WHARF ... Lease bought at Xmas 1712 for 21yrs at £120pa with a promise to add 15 more years. Paid for repairs £400 and this year about £700. QUEEN ST ... Lease bought in 1707 for 25yrs at £56pa. Paid for altering £500. LEMAN ST ... Bought in 1698 for 46yrs 8m at cost of £200. Paid for repairs about £500. LEMAN ST Double House ... Lease bought in 1701 for 43yrs at £2pa. Paid for building the said double house about £700. LAMBETH ST ... A lease with 12yrs 6m remaining at £6.0s.8d pa ground rent. Fellowes, Houlditch & Emerson, having raised £40,000 for the purchase of the sugarhouses from Joseph Bagnall, immediately spent £6000 improving them ... Mortlake £400, Battersea £2000, Westminster £500, Paul's Wharf £1200, Queen St £500, Lambeth St houses £300, Lambeth St Old House £500, Lambeth St Double House £600. After 2 years the 1724 Accounts showed settlements due of £60,045 (to sundry persons £58111, to servants £261, to tradesmen £1373, to rents £300) with assets of £62267 (stock at: Mortlake £4276; Battersea Old House £6499; Battersea New House £7036; Westminster £3707; Paul's Wharf £3874; Paul's Wharf Warehouse £684; Paul's Wharf Double House £2588; Queen St £5487; Trinity Lane £4241; Trinity Lane Double House £2810; Leman St £3199; Lambeth St £1177. And utensils £11810, building at Battersea and Queen St £3000, sundry debts due £1720, cash £157). I make that a profit of around 3.5%. Another Account book, undated but probably the following year, is similar to 1724 but shows an increase of pay due to the men (up to £300), a total insurance outlay of £3945, and a balance total of £63888. These are such huge sums of money ... the National Archives Currency Converter puts that total at over £5,500,000 today !! 1. Midway along Upper Thames St ... we are looking towards the north side of the street. The church is St Mary Somerset, on the corner of Old Fish St Hill. Beyond that are Nos. 204, 205, 206, 207, and it is 207 that is interesting. With five storeys and pulley on the front this is the sugar house of Richard Quelch 1768, Laborde & Son 1780, and Frieake & Co 1794. H & S Frieake are listed at 205 in 1813 ... possibly by then an addition to the sugar house. The house shown far right of picture was numbered 203, and the liquid sugar refiner Charles Smith was there from 1838, and with partner Robert Tyers from 1840-53, before moving south of the river. No. 202 was the sugar house of John Banks & Co 1794 and Ritherden & Co 1817 ... this would have been the next building off-picture to the right, on the other side of Five Foot Lane. Both 202 & 207 are shown as Phoenix-insured on the 1815 map, further confirmation that they were sugar houses. This picture was drawn by Thomas H Shepherd and engraved by J E Roberts c1830. Visit the Guildhall Library "Collage" website for this picture (enter 4631 in search box) and an earlier one (enter 4634 in search box). An undated 17th century deed regarding Mr Naylor's lease had written into it the proviso "that the said houses and shops be not let to nor for the use of any brewer butcher tallow chandler smith pewterer or brazier being offensive trades to the area." Notes added later to the reverse listed common brewhouse, trade of sugar baker, slaughterhouse for killing beasts, melting of tallow, and making of soap as offensive trades. © Julian Williams 2017. © Julian Williams 2017. 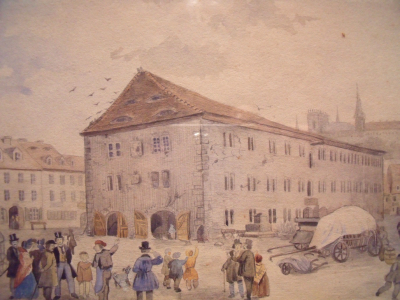 After his refinery in Hamburg was destroyed by fire in 1842, Johann Christian Langelujte was invited by the King of Saxony to relocate the business to Meissen. It was run by his son Georg Eduard Langelutje, and in turn by his son of the same name. 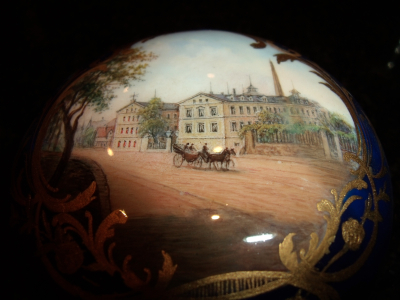 The first of these images is a painting showing their first refinery in Meissen with the cathedral in the background, the second shows a similar view painted on the lid of a fine porcelain bon bon dish. "This unprepossessing and much-altered building has its origins as a sugarhouse and is thus the sole surviving remnant of a once widespread building type in Whitechapel. It was built in 1797Ð8 for James Ballenger and was originally taller, as sugarhouses usually were. ..."